This example shows a Space Vector PWM DTC Induction Motor Drive during speed regulation. This circuit uses a modified version of the AC4 block of the Specialized Power Systems electric drives library. It models a direct torque control (DTC) induction motor drive with space vector pulse width modulation. 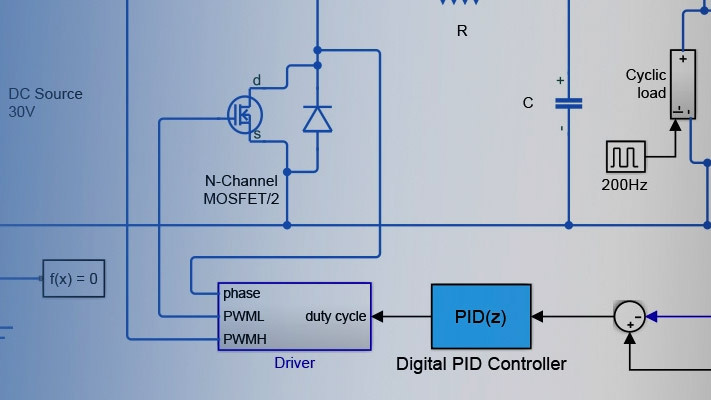 The particularity of this modified version is that the DTC is no longer based on hysteresis regulation that implies switching at variable frequency but on a fixed frequency PMW inverter. As in AC4 it uses a braking chopper for a 200HP AC motor. The induction motor is fed by a PWM voltage source inverter which is built using a Universal Bridge Block. The speed control loop uses a proportional-integral controller to produce the flux and torque references for the DTC block. The DTC block computes the motor torque and flux estimates and compares them to their respective reference. The torque and flux are then controlled by independent PI regulators that compute a reference voltage vector. The voltage source inverter is then controlled by the space vector modulation method in order to output the desired reference voltage. Motor current, speed, and torque signals are available at the output of the block. Start the simulation. You can observe the motor stator current, the rotor speed, the electromagnetic torque and the DC bus voltage on the scope. The speed set point and the torque set point are also shown. At time t = 0 s, the speed set point is 500 rpm. Observe that the speed follows precisely the acceleration ramp. At t = 0.5 s, the full load torque is applied to the motor shaft while the motor speed is still ramping to its final value. This forces the electromagnetic torque to increase to the user-defined maximum value (1200 N.m) and then to stabilize at 820 N.m once the speed ramping is completed and the motor has reached 500 rpm. At t = 1 s, the speed set point is changed to 0 rpm. The speed decreases down to 0 rpm by following precisely the deceleration ramp even though the mechanical load is inverted abruptly, passing from 792 N.m to - 792 N.m, at t = 1.5 s. Shortly after, the motor speed stabilizes at 0 rpm. Finally, note how well the DC bus voltage is regulated during the whole simulation period. The power system has been discretised with a 2us time step. The speed controller uses a 140 us sample and the DTC controller uses a 20 us sample time in order to simulate a microcontroller control device. The inverter switching frequency is set to 5 kHz.